The images of clusters are sorted by date, latest first. 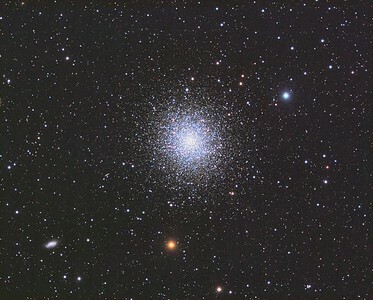 M13 Hercules Globular Cluster. RGB + Luminance. 1.33"/pixel image scale. Astrodon I series Red filter, 22 x 2 minutes, 1x1. 6/12/2018. Astrodon I series Green filter, 22 x 2 minutes, 1x1. 6/12/2018. Astrodon I series Blue filter, 22 x 2 minutes, 1x1. 6/12/2018. Astrodon I series Lum filter, 66 x 2 minutes, 1x1. 6/12/2018. TEC 140 APO F/5 with A-P Quad TCC, Astro-Physics A-P1100GTO GEM with absolute encoders. QSI660wsg. OAG and Ultrastar autoguider, Optec Handy Stepper Motor focuser. Captured and automated with SGP. Calibration and Post-processed with PixInsight. PHD2 settings: RA Aggressiveness: 60, RA Hysteresis: 10, Max RA/Dec Duration: 2000, Min Move: 0.38, Calibration Steps: 300msec, Auto/Resist Switching, 2 sec guiding exposure. 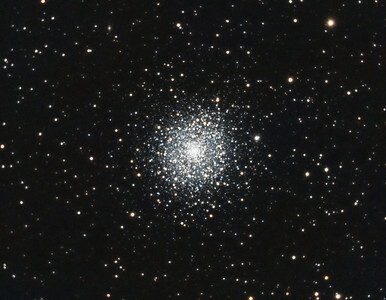 M92, Globular Cluster in Hercules. 6/25/2011. CPC0800 F/6.3 focal reducer. Mitty Wedge. SXVR-M25C. IDAS LPS Filter. Hutech OAG. Lodestar. 31 x 5 minutes. Total 155 minutes. Pre-Processed (Dark, Bias, Flats Calibration and Debayer) with Nebulosity. Stacked and Post-processed with PixInsight. PHD settings: RA Aggressivemess: 90, RA Hysteresis: 10, RA Max Duration: 600, Dec Max Duration: 600, Min Motion: 0.60, Calibration Steps: 750msec, Auto/Resist Switching, Dithering: Extreme and Settle < 0.5, 0.5 sec guiding exposure.